Our Adoption Day was a wonderful experience. We were joined by family and friends at the courthouse, had a picture day at Coronado Island, and then ended the day celebrating at Chuck E Cheese. Our good friend, Tira Young, of Tira Young Photography, joined us for the day and took many wonderful pictures. Tira created a slideshow of the pictures that you can view HERE. I created a digital scrapbook from these pictures so that I could give copies to friends and family, but I also wanted to create a single spread for our scrapbook album. I was able to find the adoption background paper from the left hand side, and the adoption poem transparency on the right hand side on Ebay. 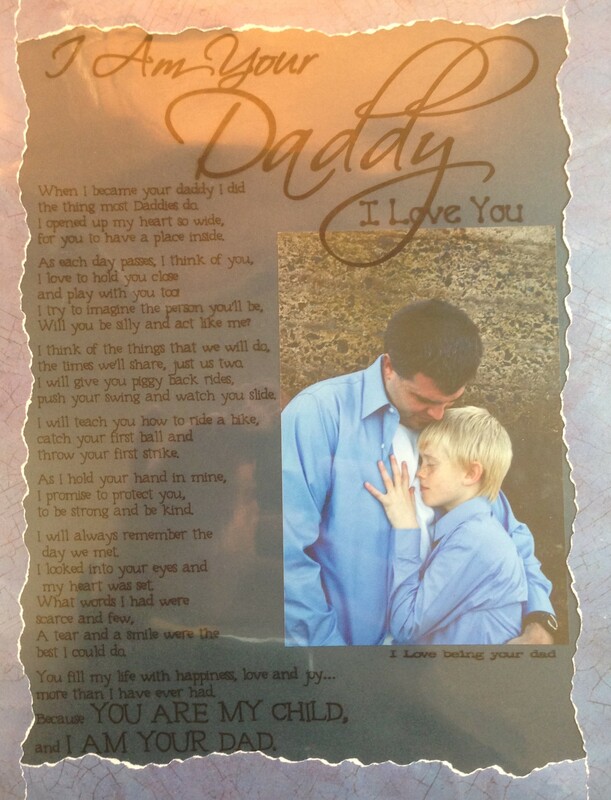 The transparency has a poem about being a father on it, and I created a closeup of it to the left. If you click on the photo you should be able to read the poem. Unfortunately the plastic transparency combined with the plastic protector sheet created a reflective glare on the picture. I placed the picture of us on the page first, and then placed the transparency over the top of the picture and affixed the edges with sticky tabs. Since you could see the sticky tabs through the transparency I then used torn paper to create a boundary around the page, which also helped tie the color scheme to the left hand page.